Just a a note, Rainbow Gatherings around the world take many forms, some familiar, and some not. This is the fun of traveling and experiencing other cultures. 3rd Annual World Rainbow Gathering will be held in Brazil from new moon March to new moon of April in 2003. The invitation and map of how to get to the gathering (final location) has been posted in the brazilcaravan files section. 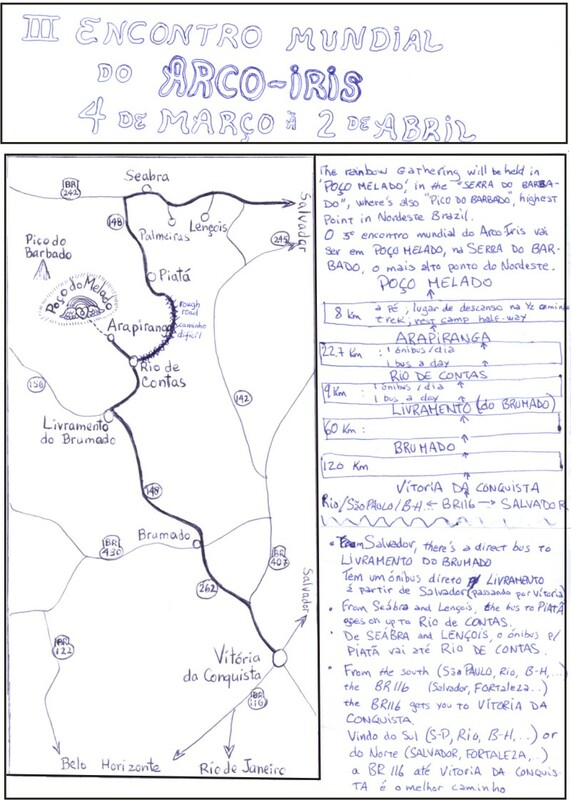 Here's my local copy of the map, so you don't have to be subscribed to the Brazil Caravan discussion list. For more info, try the Brazil Caravan discussion lists at http://groups.yahoo.com/group/brazilcaravan. Unofficial Gathering at Nimbin Rocks Aboriginal community. It begins with a Welcome Ceremony at the Nimbin Rocks by the Aboriginal Community. This gathering is a special anniversary! 30yrs ago the first rainbow tribe arrived in nimbin! Hellenic Rainbow gathering in Greece. For more information, go to the Greek Rainbow web site. Scouting meeting on the beach around the 21 juin in Beauduc meditation for peace for 4 days and meeting of scouting after Arles (camargue) take " les salins de girault " then Beauduc see you soon in harmony ! 7th annual Turkish Rainbow Gathering. The Kure mountains of the western Blacksea region invites all loving creatures to gather and share under the rainbow, in a circle of love, peace and harmony among all. The scouting will start around the 1st of june, near Kastamonu, 500 kms east of Istanbul. The gathering starts with the summer solstice celebrations on the 21st of june and will last till after the fullmoon of july 13th. The region is among the most well-preserved pieces of environment in the mother earth and around 1000 mts high. The seasonal rains of "carkdonumu" (the changing of the wheel) starts about 10 days after the solstice and lasts for a week. So be prepared for the Mother's lessons and bring warm, dry clothing and shelter. Please keep in mind that all rainbow gatherings are intented to HEAL, heal us and our surrounding and therefore considered retreats. So please avoid bringing in alcohol, any kind of drugs, addictions and other things that can be unhealty for us and the environment like processed food, electrical equipment, non-biodegradable items, mobile phone...etc. Instead, bring; LOVE, PEACE, MUSIC, WISDOM, HARMONY, UNDERSTANDING...etc. Contact with the focalizers for further info; email: aykut or Rainbow Turkey. Russian Rainbow gathering near Cheboksary (middle Volga region); it is about 600 km from Moscow in the east direction by the motorway M7 (Moscow-Vladimir-Nizhnij Novgorod - Cheboksary -Kazan'). You can find further details and the map at http://tangerin.by.ru/rainbow/ (English version is also available following the link from that page). The direct link to the English version is http://tangerin.by.ru/rainbow/engl2003.htm For more info, email Ilu or Veronika There may be info on the Russian Rainbow web site, but I can't read Russian. Italian Rainbow Gathering near Modena, next to Riolunato. Swiss Gathering. On weekend, we were about 50 Persons, & we loved to welcome also some swiss RB veterans, like Paul, doing the swat-lodge all night in a very beautiful way. Weather is nice, a small river invites to have a bath. Some small Problems, are easy to ignore(;-) The road is easy to find. There are RB-signs from Trainstation Lanzenh�usern (Bern-Schwarzenburg). From Lanzenh�usern, its about 1hour of walk. Car-parking is about 20min from the gathering-place. Mirapuri Gathering in Mirapuri-Coiromonte, Italy in the beautiful mountain area above Lago Maggiore. For more see: www.Mirapuri-Enterprises.com/RainbowGathering This is not probably your typical Rainbow Gathering, but a similar event. 14th Hellenic (Greek) Gathering starts on Autumn�s Equinox Day (Sep. 23). Seed Camp starts on Sep. 15. The complete invitation with the map was on the info board in the European Gathering in France and can also be found at : Greek Rainbow Family web site. Argentina Rainbow scout council in Patagonia, Argentina, we will meet in �� jardin de paz��, 50 km south bolson - near bariloche - neuquen - scout will have horses for scouting. Rainbow Family Tribe of Living Light in the Middle East Annual Gathering. We, who are brothers & sisters, children of G!d/The Great Spirit, families of invite all races, peoples, tribes, communes, men, women, children, individuals,+out of love, to join with us in gathering together (full moon, the evening of November 9, 2003. For the purpose of expressing our sincere desire that there shall be peace on earth, harmony among all people. For more info, go to theIsraeli Rainbow Family. web site. For more instructions and communications, go to http://www.groups.yahoo.com/groups/serpientearcoiris After the gathering we will be caravanning to Costa Rica for the 'One World Gathering' in March. 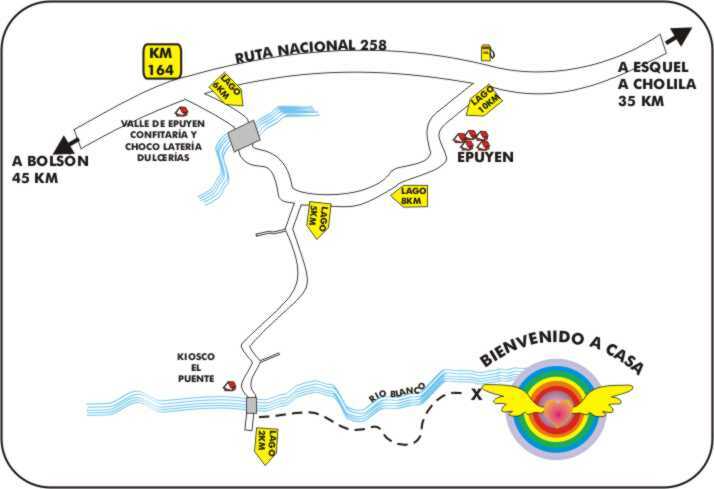 Seed camp starts at Rio Blanco, 8 km from Epuyen, 45 km from El Bolson. International Airport at Bariloche, Bus to Epuyen from Bariloche, From Epuyen, 6 km walk, direction lago (possibel to itchike), and rainbow sign going from Rio Blanco Brige to the camp 2 more km). OR Shorter way: go down the bus at "Valle de Epuyen" (3km befor Epuyen), 4 km walk, direction lago (possibel to itchike), and rainbow sign going from Rio Blanco Brige to the camp (2 more km). La Gomera island is southeast of Tenerife, one of the major Canary Islands The nearest town is on La Gomera is Alojera, you can arrive there by bus from Valle hermoso or Chipude. From Alojera go down with the road following the rainbow signs to Playa de Trigo. You can arrive also by car to the end of the road that is about 10 min walking distance. From Tenerife, Los Christianos to San Sebastian de La Gomera, Ferry boat at: 8:30, 8:45, 9:00, 13:30, 13:45, 14:00 (mon- fri), 17:30, 18:20, 19:00 (wed, fri, sun), 20:00. Bus connection: San Sebastian - Valle Hermoso at 10:10, 18:30. Valle Hermoso Alojera at 14:00. Chipude Alojera at 7:20. Contacts: Mark Tel: 699364445 E-mail: Apurva jivantree@yahoo.com or Eyal rainbowashram@yahoo.com Spread the information. Rainbow Retreat Gathering on Andaman Islands in India. Rainbow Retreats are Gatherings where people live a very clear life. They use no tobacco, marihuana, coffee, black tea or sugar. Often connected with practicing of purification of mind and body. Meeting point will be on the 21st of December 03 at Central Lodge on Port Blair. From there we will go together to the retreat place. One World Gathering in Costa Rica. More info at http://groups.yahoo.com/group/costaricaravan If you're not a member (yahoo reqires registration), login is: brazilcaravan password: love. 1st Turtle Island World Gathering. The dates we consensed on are from full moon to full moon, with a focus on silent meditation for world Peace on new moon until high noon, on the 15th of August. We consensed on gathering in the western part of Quebec to make it simpler for the rest of the Family coming from abroad, and for other reasons exposed in details in our council circles.